Remove the sidebar on one page? Add a Twitter feed to the sidebar? Previously: How to start a new site. Part of a series of tutorials on using WebCommons. How to get to the login screen. Once you’re at the login screen, pictured below, enter your username (same as your Network ID, used to login to Blackboard) and your password. 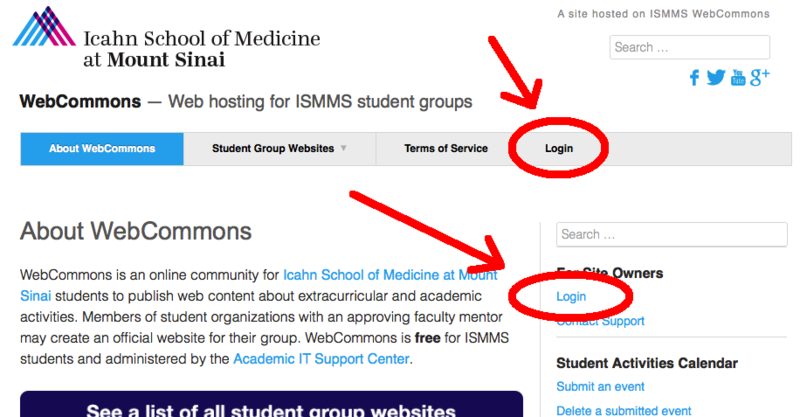 Your password is not the same as your Blackboard (aka MSSMCAMPUS) password. It was either emailed to you by ASCIT, or you set it yourself. 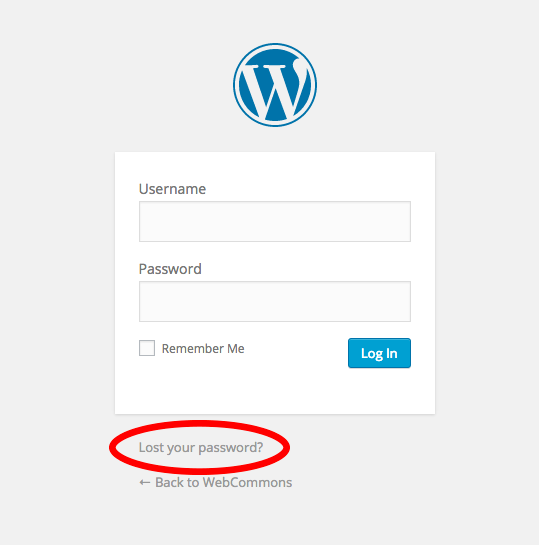 If you aren’t having any success, use the link circled below to reset your password (a link will be emailed to you). The login screen and the link to reset your password. The lost password thing isn’t working! First, check your spam folder, since sometimes lost password emails wind up there. If no message appears in ~3 minutes, it’s most likely because you do not yet have an account, or it was set up incorrectly. If you’ve never been on WebCommons before, you need to request an account either by either asking to create a site or to join an existing site. If you know you’ve already requested an account, ask ASCIT@mssm.edu whether they can reset it for you. If all else fails, let the Student Council Secretary know you’re locked out. Then, scroll down and you’ll find a New Password area. It will encourage you to generate a strong password, but you can override this by checking another box. Of course, I encourage you to use a strong password as you are responsible for the activity on your account. Great, you can move on to the other tutorials now! Nothing from April 23, 2019 to April 29, 2019.